I really wanted to love this book mainly because I love Juliet Marillier's writing style--her use of creative detail and lyrical narration has a sort of beauty to it. Like magic. And the one thing I can honestly say about Shadowfell that I did love, a hundred percent, was the writing and the world building. The characters I'm slightly lukewarm about, the story was well-thought, and the concept was good. But the progression was quite slow and it took some time before I understood the direction of the story line. Nonetheless, Shadowfell is a very well-written high fantasy with a wonderfully created world that I intend to continue diving into. Alban is a dark place ruled by an evil king. Those with special canny abilities such as Neryn are either killed or taken to do His Majesty's bidding. The intermingling of the uncanny creatures--fey beings--and humans is against the law. And a Culling takes place regularly to seek out and destroy all who possess special gifted abilities, all who have any relation with the uncanny folk, and even those who may have come in contact with or own items created by the fey beings. Neryn has been on the run since her family was destroyed, her grandmother and brother perishing at the hands of King Keldec's own elite army of Enforcers. But she possesses a magical ability that, if found out, could either mean the further destruction of Alban at Keldec's hands, or a possible future of freedom for Alban's common folk. With the death of her father, Neryn now travels to the secret place of Shadowfell, a place of rebels where there are people of whom she can have a possible future; a place where no one will be frightened of her abilities nor look upon her in anger or disgust nor turn her into the Enforcers. Along her adventure, she begins to realize the extent and significance of her abilities as she meets and befriends the fey beings called the Good Folk as well as other uncanny creatures who might aid her in her travels. 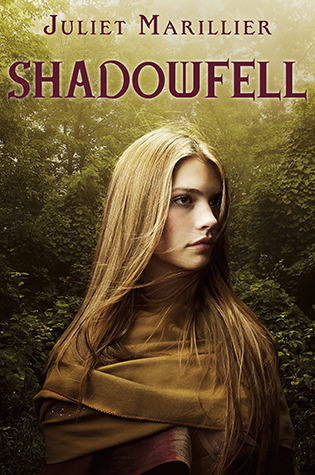 Shadowfell had a slow start, then got exciting, then became a little monotonous again, and then finally ended on a well-thought out, inspiring, yet not quite exciting note. With Neryn traveling by herself for a good portion of the book and coming across several mysterious, magical events, as well as performing different acts to establish her virtues, I had hoped that the traveling adventure would have been a little more interesting. But from the moment she starts her journey alone, each event seemed to go by on a flat note with each happening occurring in a too convenient fashion to get Neryn where she needs to be, both physically and literally. It's a very long-winded high fantasy of adventure and lots and lots of traveling... which to be honest, was one of the things that I had always found boring about some high fantasies (The Hobbit being a prime example of great world building, but a long, monotonous story set up that followed a lot of monotonous traveling by the single protagonist of the book.) Of course, without the first half of set up, we wouldn't be able to move forward to where the story needs to be to pick up it's continuing adventure. So it's conflicting to me whether or not I liked it. The characters didn't really do much for me, though they definitely had a lot of potential and a lot of significance within the story line. The entire experience just seemed to go by in such a blur that I felt a little less than piqued to be excited. Although I did find the friendship between Neryn and Flint rather sweet despite the fact that 80% of the book found them keeping secrets from each other and Neryn not even trusting Flint. Is it strange that by the time the conclusion rolled around, I actually found Flint a bit swoony even though he doesn't really have too much book time and doesn't stand out all that well? Enjoyable, but not as exciting or intriguing as I'd hoped. Beautiful writing and wonderfully created world with well-crafted back history, and decent enough characters to follow.